A delightful colouring book based on the bestselling ‘That’s not my…’ series. Each page shows a coloured picture of a holiday scene or object and a black and white outline version of the same picture for children to colour in. 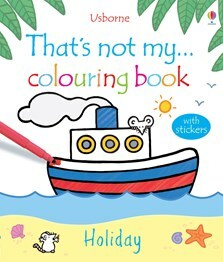 Includes a space for children to write the phrase ‘That’s not my…’ and 4 pages of colourful stickers. That's not my... colouring and activity sheets to download.